It’s that little thing on the headstock, between your nut and tuners. The strings install under it. Their job is to provide a steeper angle over the nut (see posts on string break angle background and on break angle problems). You’ll find them most often on guitars with locking tremolo systems like Floyd Rose and Ibanez Edge bridges. Now, you’d think that a guitar with a locking nut wouldn’t strictly need a string retainer because the nut string clamps will just lock those strings down so the section between nut and tuners is out of the picture. Well, yes. That’s true. To an extent. On instruments fitted with locking nuts, though, these retainer bars perform another function. And if you’ve got one, of these you’ll want to be sure it’s properly adjusted. 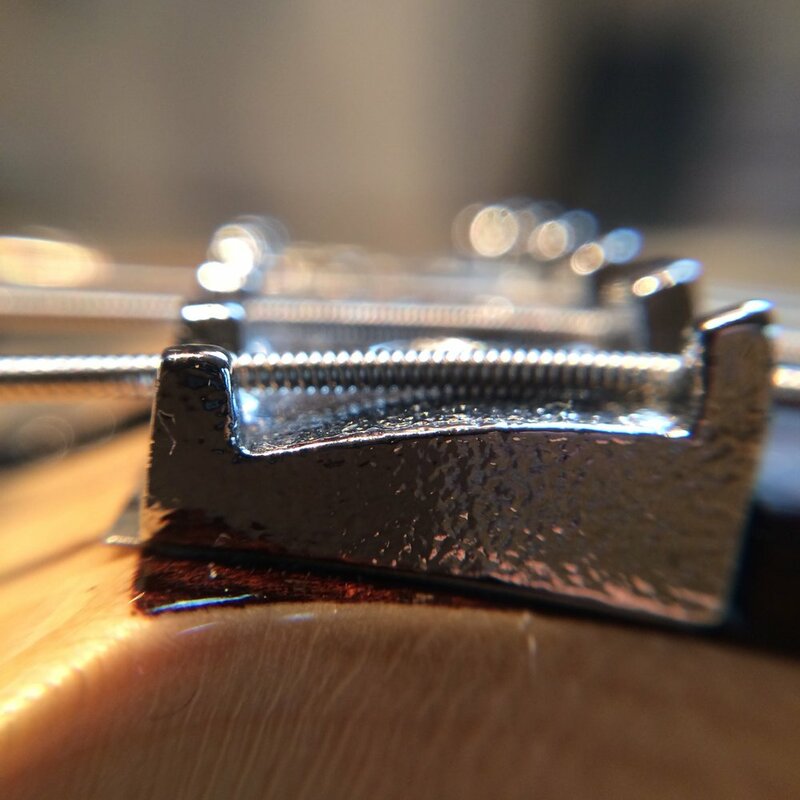 On a regular guitar or bass, you probably don’t need to expend a lot of thought on the retainer bar adjustment. With a locking nut, you do. If you check out the images below, you’ll see a gap between the string and the back (left side) of the lock nut. This gap means that, when you tighten down the string clamps, the string’s tuning will be pulled sharp. The clamp will fasten down onto the string, closing that gap and stretching the string in the process. This will obviously increase the pitch. Usually you’ll be able to compensate with your fine tuners at the bridge but you’ve then sacrificed some of their travel and added time and extra tuning steps to your day. No one wants that. What you want to do is to lower your retainer bar by screwing it down closer to the headstock. This will pull the strings down so they ride along the full width of the nut. Keep checking how the string sit on the nut as you do. What you want to see is a string that contacts the nut all the way across. Leave no gap at the rear of the nut. Tighten down the retainer bar until all strings contact all across the lock-nut base. If the sting sits flat all across the nut, clamping it down should have almost no effect on tuning. At most, you’ll need tiny tweaks of the fine tuners. You don’t need to tighten these down like your life depends on it. They don’t have to be incredibly tight. You don’t have to hire two burly roadies to help tighten the string clamps. Everybody over-tightens these things. You’re not trying to mash the string like a penny on a railway track.